PS. These journal entries are being written AFTER the vacation was over, which is why I have time to sit down and recall all the details of the trip, in comparison to the daily entries that were written DURING the trip. That’s why these, in comparison are so long. For the record, let me just say that today, for some reason, I don’t know why, but today ALL OUR PLANS WORKED! We mapped out the day accordingly, did our fast-passes, and actually got everything done with extra time to spare. Like, how did that even ruddy happen, and why was it just the one day!? Who knows, but it felt amazing to have just everything going so smoothly for once. Something amazing that happened today that hadn’t happened on any other day was that in the morning on the way to Epcot, WE GOT SEATS ON THE BUS! This is amazing because our bus only comes twice a day, and our hotel is one of the last few stops before Epcot. Usually the bus is full and I have to sit on the stairs, but today it was relatively empty and we got to sit down, which was a plus. Got to Epcot, it was hot, got our Mickey’s Not So Scary Halloween Party tickets, and headed in just in time to get the last bit of the Frozen Fun parade. Oh well. We walked around, took some pictures, got an Olaf fan, it was really ruddy hot. And decided which way we wanted to go first. We decided to go to the Animation Building where most of the characters were so we could get autographs. First line we jumped in was Wreck it Ralph. Unfortunately they didn’t sign, but that’s okay because we got cards instead. Next was the Incredibles line. Mr Incredible and Frozone talked to us for a pretty long time. Oh, and speaking of small world, while we were in the Incredibles line, behind us was the exact same family behind us in the Pluto line back at Magic Kingdom. Like how crazy is that!? After we got our Autographs guess what? IT STARTED TO RAIN!!! So we went to go see this, Animation….something or other video with Mushu in it. Which was neat. I feel bad for the presenters, because they have to talk so fast to get the timing right with the recorded video. I guess that’s why they get paid more. Oops, spoilers. While it was still raining we headed out to the Pixar area to get Woody and Buzz’s autograph since we didn’t get a chance to get it at Magic Kingdom. Ahh the place hadn’t changed. Except for that new Legend of Captain Jack thing that wasn’t there before. While we were trying to find out where the autographs were we passed the Midway Mania game that we loved back when we visited in 2011. HOLY SHHHHH!!!! 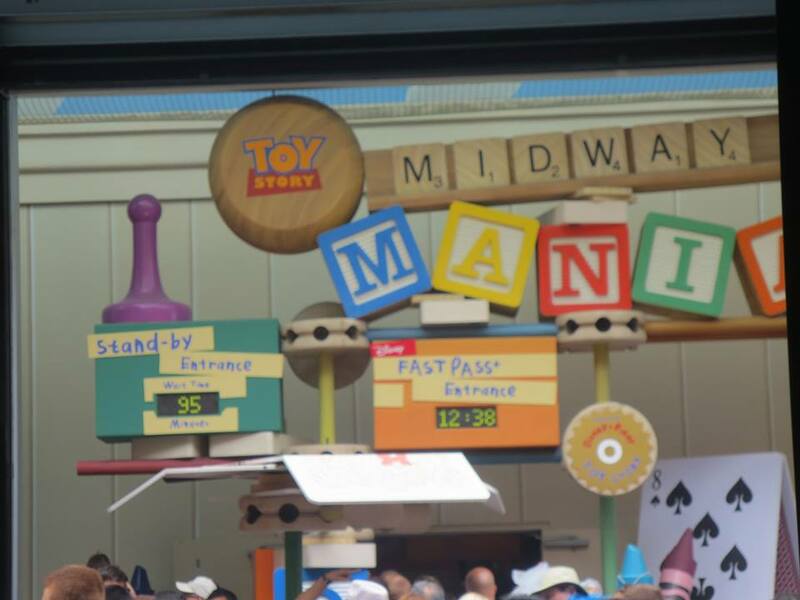 The line was like….85 minutes and then it went up to 95 minutes. Even the fast-pass line was long, it was insane! Forget that. For some reason…Woody and Buzz were massive, and that’s when I realized that when we took the photos, we were standing on Andy’s bed and it was a trick of perspective. Pretty neat! Connie’s really into stunt shows for some reason, I’m more into parkour even though I couldn’t physically do it, so stunt shows aren’t all that interesting to me. But she wanted to go see a car show and I wasn’t going to be selfish and not go. I swear I’d seen this car show back in like….2001 or something, just a really long time ago when Hollywood Studios was still MGM. After our walk we saw this…massive line, outside of Oaken’s Trading Post. I finally figured out that there was ICE SKATING! but the line was like super long. Figures…everyone in Florida wants to go ice skating because they don’t get ice…or winter. I totally wanted to go ice skating but that line was way too long. So we went into the store instead. Seriously though, that AC was serious. Like it was super cold in there. It was awesome cause we got to cool down, but it was like a serious temperature change. It was then, time for lunch, which we had to find. 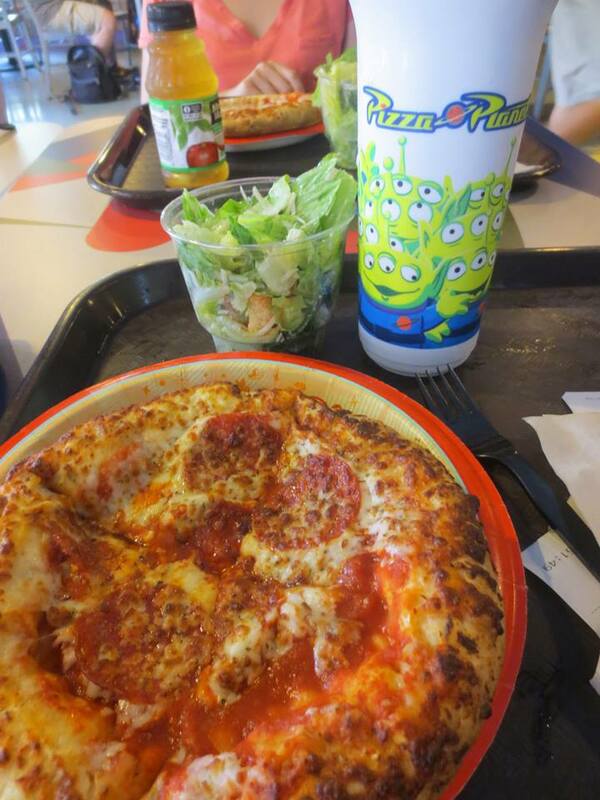 And the only good place to eat in Hollywood studios other than the Sci-Fi drive in, is Pizza Planet, from Toy Story. Ahh how sentimental was Pizza Planet. Pizza and and Arcade, so cute. There’s nothing like thick pepperoni pizza, soda, and caesar salad for lunch to make you feel better. On that Pixar note, we headed down to see Mike and Sully to get autographs. Man that line was long. It’s funny being in these autograph lines when you aren’t a kid, or don’t have kids, but whatever! It’s not like we’re coming back so we’re not ashamed. From Pixar we headed up to Star Wars land! Because Disney wants to own everything and so they bought Star Wars. It was funny rounding a corner going “Look, we’re in Tatooine.” How often do you ever get to say that! We explored the lay of the land and entered the Tatooine Traders, where we took silly pictures and looked up how to make our own droid. 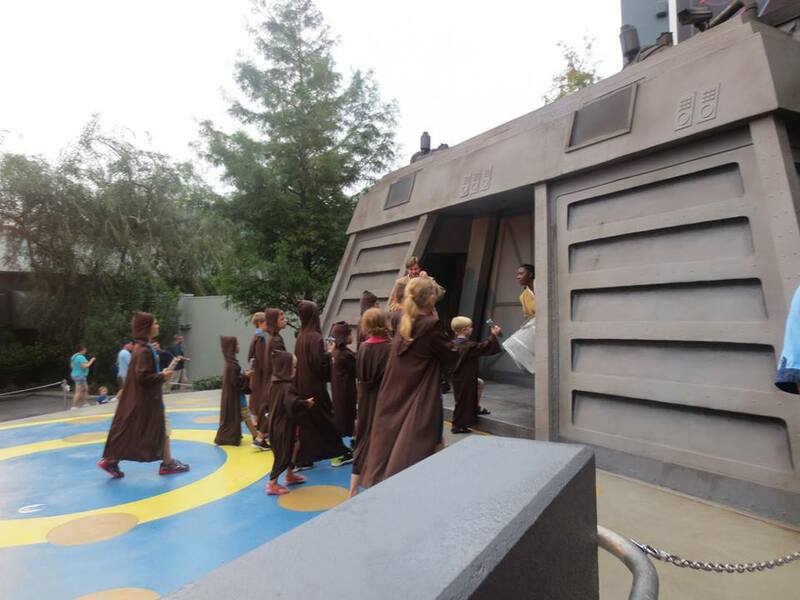 We even caught the end of some young padawan graduating from the academy. Totally not fair cause I want to go to the Jedi Academy. Our next fast-pass was the Indian Jones stunt show, also something Connie picked. At least it was a much better improvement from the Indiana Jones show I saw back in 2001. At least we could sit this time and not stand. We were in line for a pretty long time, and there was this really annoying jungle mist machine on us, getting us all wet… Oh. I forgot to mention something. People around my age and older were all dressed up funny….like from the 80’s or something (maybe even earlier, I’m bad with history) and I couldn’t figure out why… Then I overheard someone say that it was DAPPER DAY. WTF!? Even Connie was confused, but the way I understand it is like….whatever time period Annie was filmed in….that’s it. You know that song “You’re never fully dressed without a smile?” from Annie, yeah that’s what I think of every time I saw people in dress. But yeah, Dapper Day, it’s a thing. Where people just have an excuse to dress up. So we watched the Indiana Jones show, and there was this like….SQUIRREL! Who like ran onto the set for some reason, DURING THE GUN SCENE, and I swear, someone was going to fake shoot the squirrel, and that squirrel was seriously going to die from a stroke, so it bolted right across the stage and we were all cheering, just for that tiny little squirrel cause it didn’t die. It was amazing! It was the highlight of the show. After, our next fast-pass that was also perfectly timed was Star Tour. The improved ride! I went on with a lot of expectations, and sadly they weren’t exactly met. I expected….more movement, faster, especially considering they asked us to use a seatbelt and to show our personal belongings, as if we were going to be moving a lot. It was a little disappointing, but the graphics were amazing. Our last fast-pass was for Fantasmic, and since we had plenty of time to kill we decided to go window shopping in the Villain store. The first half smelled like calories and diabetes, after that it was okay. I loved all the villain stuff though, that was cool. Disappointingly they didn’t have a lot of Maleficent stuff which was weird, cause I thought they’d be trying to sell the shite out of it. On our way out of the store, we saw a huge crowd of people in front of the Disney Hat stage and we decided to go check it out. There was live band there playing pretty good music so we decided to dance for a while. They even brought out the characters to dance with everyone which was really neat. We stayed a really long time until it was time to go. I had one thing to buy before Fantasmic, and that was this beautiful Animation Collection, Elsa doll that was just so chibi and beautiful. I don’t care that I’m an adult and I spent like $30 on a doll. I DON’T NEED YOU! I was happy that during Fantasmic we didn’t end up doing the wave for like an hour and a half, but it was just weird…cause they changed the show in the three years and I didn’t really like it all that much. For one thing, the show was mostly on the water project and let’s face it, the projects just aren’t that strong so it was really hard to see. Most of the show was the same, and obviously my favourite part was the end where all the characters are on the steamboat. Literally right after Fantasmic, we had to run back to the Hat so we didn’t miss the Frozen fireworks. It was where everyone was going. Obviously the crowd was moving super slow, so we decided to speed walk and weave through the crowds. Connie crossed in front of a stroller and the husband or whatever was sort of yelling at her, but I told her to ignore it. Then I crossed in front of him not 10 seconds later and he got pissed at me, pretty much ran over the backs of my feet with the stroller…ouch, that sort of hurt but whatever. He was pretty pissed too, but eff him. What if we had a shuttle to catch which was why we were trying to get past him cause him and his stroller were too slow. He doesn’t know why we’re going to fast. Disney World is the one place I don’t really mind strollers in an amusement park, but yeah, we had to be somewhere so we were going to cross all your strollers. Hell, I would have jumped over it if the place wasn’t too crowded and if he wasn’t moving so slow. Anyway, we eventually found a nice spot in front of the TV to take pictures and video of the fireworks and were headed home. They were pretty cool fireworks too, but not as epic as Magic Kingdom. Now it was time to run back to the shuttle (which the driver lied and said we wouldn’t make it, but we did, with time to spare, so we were sitting on the ground for a while) and head home to the hotel. But not before passing by Walgreens for food and water, cause we were out of water. Damn that Walgreens was far when you’re tired as hell.